Arriving in Managua was a strange déjà vu dream. Almost one year prior, I had arrived in the same Augusto C. Sandino International Airport to begin my enrollment the SIT study abroad program, focusing on themes on Youth Culture, Literacy and Media. This time, I was completely alone and setting off to conduct my own research. There was no program or equally nervous companions to walk with me through the past the medical scanners searching for signs of chikungunya. I was here to conduct my own research, with a mere five days to complete it. As I rode from the airport to my hotel, I kept my face was glued to the window as I tried to reconcile my memories of this city with the present reality. I noticed something slightly off from my initial observation I made upon my arrival a year earlier. As soon as I stepped out of the airport in January of 2015, I couldn’t avoid the giant, metal yellow tree structures gleaming with hundreds of small light bulbs. They stuck out in the aesthetic of the second poorest country in the western hemisphere. 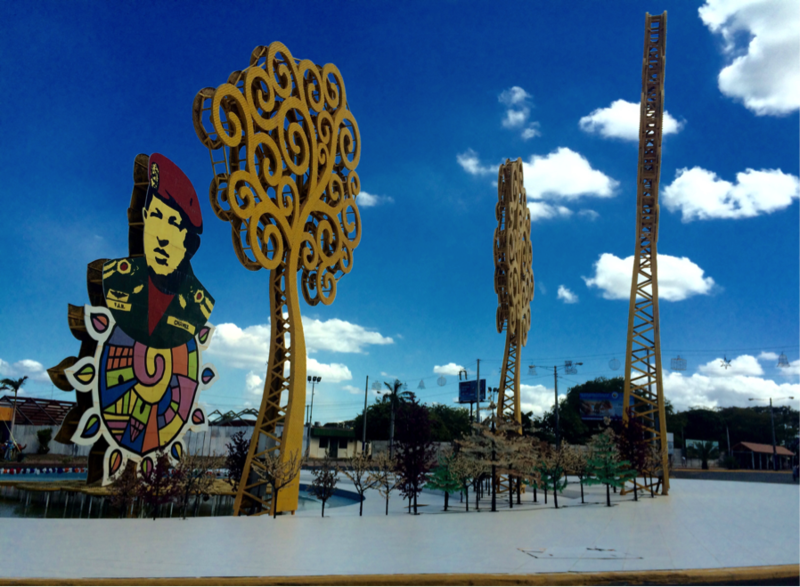 My Nicaraguan program coordinator explained to me and the other students on my program that these “trees of life” were built by the current Sandinista government. The trees were a pointed sign of contention, as my host family struggled to pay their own electricity while they watched the lights of these strange metal trees beam 24/7. Now I turned to my driver and pointed to the trees: “They changed them.” Not only were there yellow trees down the main avenue, but now there were purple, green, pink, red, and blue trees alongside them and down the side roads. My driver explained that they tore down the old ones and replaced them with these new colors, adding more trees throughout the capital as well as other small cities throughout Managua. As I passed my third billboard for the current ruling political party exclaiming “Onward we go!”, I realized why: 2016 is election year for Nicaragua as well and the current president Daniel Ortega had adjusted the constitution to allow him to continue to run indefinitely. These new trees were some of the many adornments of public space by the current government, who employ e a comic-sans like font and pastel colors to symbolize their post-revolutionary party. These events, images and structured all shaped the way I looked at my research. In interviews with college students, I tried to understand how current politics effected how they learned about their recent national past. While all of my questions focused entirely on pedagogy of history, the politicization of this history came up in every interview. As I asked these students about memorialization in public space, many expressed distrust and recognized the politicization of these spaces. As these young people prepare to vote in this election, it will be interesting to see how the narratives in these public spaces affect the results in the voting both.